Caesars original 1966 grand opening postcard. A 1966 shot of the sole (14-story 680-room) Roman Tower. The small, rectangular (14-story 222-room) Centurion Tower in front was the first addition in 1970. The original curved Roman Tower was then extended behind the Centurion Tower in a reverse curve. The 22-story Forum tower on the right was added in 1979. Notice the new entrance Porte Cochere. 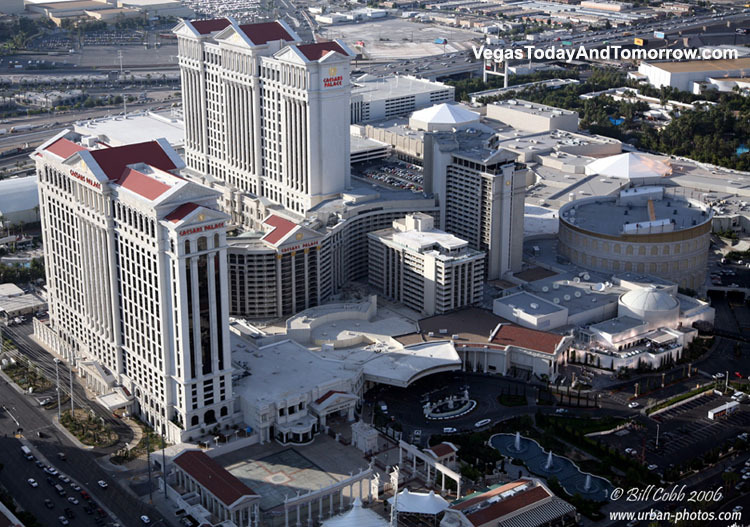 The Palace Tower was added in 1997 as well as the Forum Shops mall, more casino space, a major conference and meeting facility and an all new roman garden pool area. In 2000 the facades of all the older buildings were remodeled to reflect the Romanesque style of the new tower and mall. This theme is being replicated all over the resort. The Porte Cochere was also remodeled (again). The mall was expanded and the Coliseum was under construction. 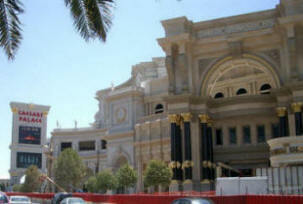 In 2004 the opulent Forum Shops were expanded again. This time with a three story mall complete with spiral escalators. This expansion was added to the front of the mall, taking it right up to the Strip. In August 2005 the (35-story 949-suite) Augusta Tower opened on the south side of the property. An additional pool, more meeting space and a new Grand Lobby are included. The new Roman Plaza on the corner of The Strip and Flamingo Blvd. guides guests to the entrance. From the north corner to the south corner (along the Strip) this mega-resort spans 1/3 mile. 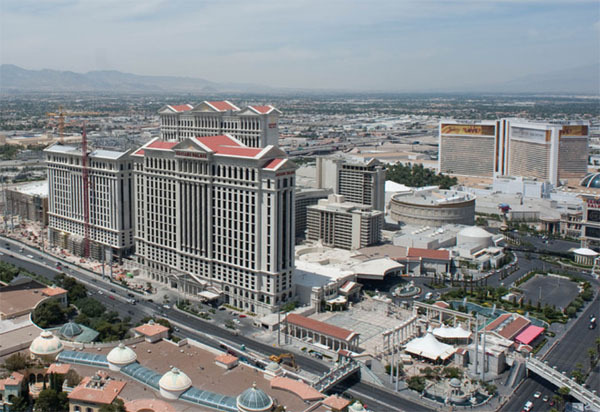 The Octavius Tower opened on 2011 bringing the total room count to 3,998 and making Caesars the 10th largest hotel in the world.